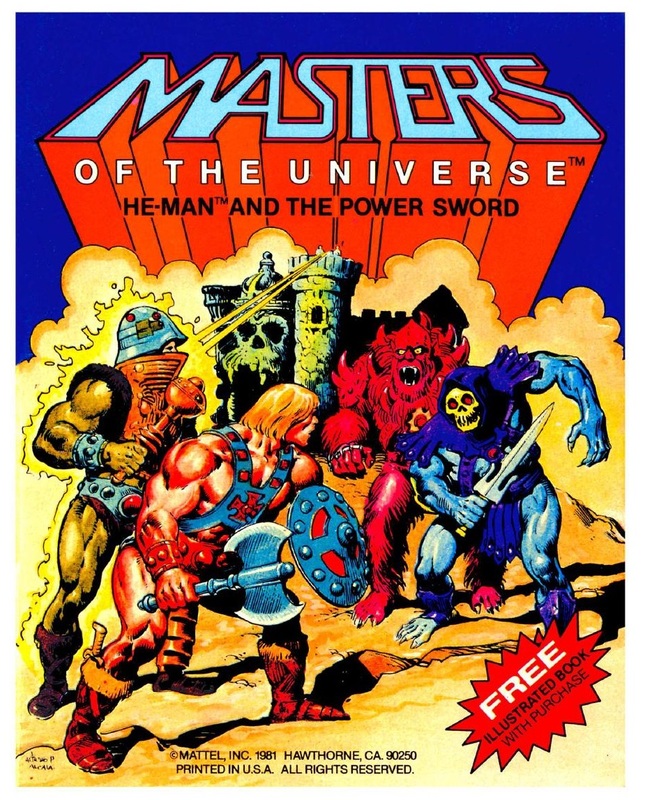 He-Man and the Masters of the Universe Minicomic Collection (released October 21, 2015) is a comprehensive collection of minicomics from 1982 to the early 90s, plus a taste of the 2002 and modern Masters of the Universe Classics mini comics. 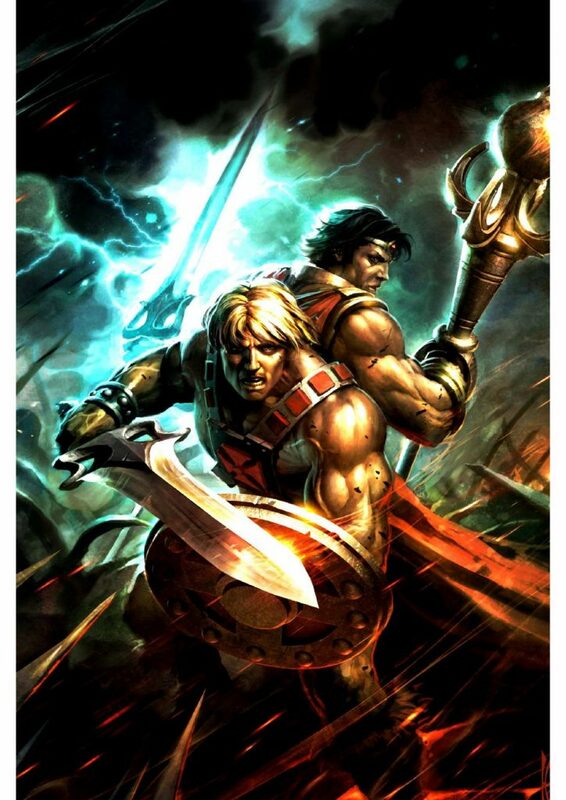 It’s a concept that I think a lot of He-Man and She-Ra fans had been wishing for for quite some time. The collection was edited by Daniel Chabon and Ian Tucker, with advisement from Val Staples. The comics themselves were scanned and collected by Leanne Hannah, Rod Hannah, Jon Kallis, Rachel Crockett, and Val Staples. 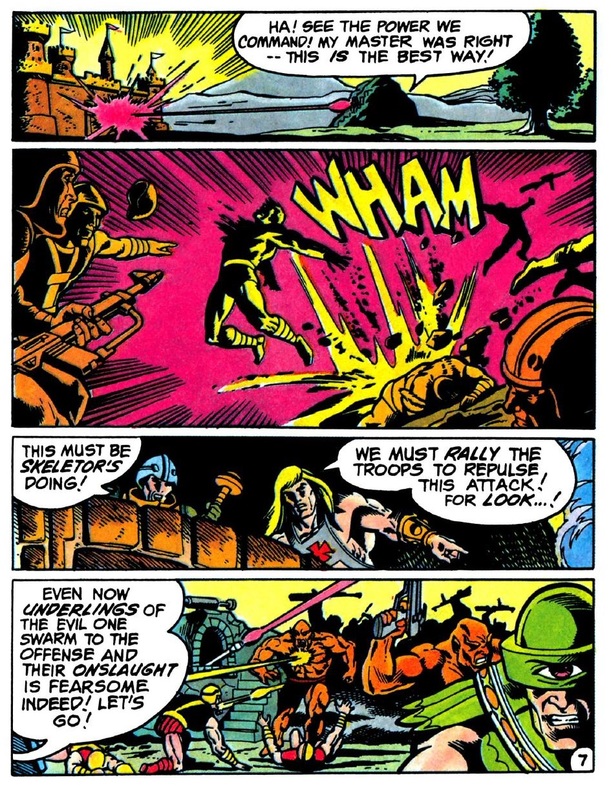 Many of these comics had been available for some time digitally from sources like He-Man.org and The Good Old Days, but not always scanned in high resolution, and certainly not always in a format that was easy to read. Collecting minicomics for the most part isn’t generally terribly expensive – that is, until you get to rare issues like The Ultimate Battleground or Energy Zoids. And certainly having the comics collected in one book is a more convenient to consume and digest them. Having a comprehensive collection in production order nudged me to read read comics I might have otherwise skipped. And of course the pages are blown up significantly larger than the original printings, with the exception of The Power of Point Dread. Dark Horse’s Minicomic Collection covers more than just standard release comics. The previously unpublished Return From Terror Island (inked but uncolored) is included along with an introduction by James Eatock. 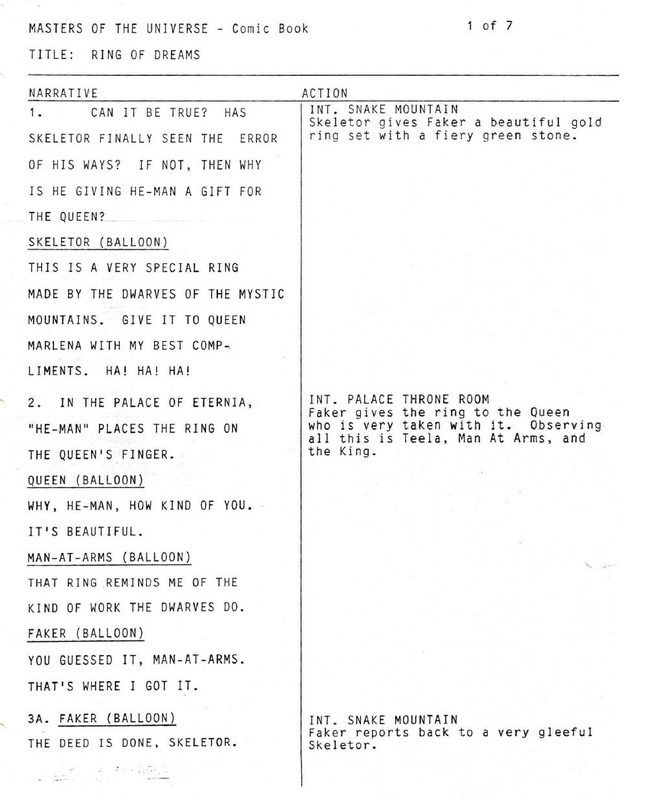 There is also a script for another unpublished comic, Ring of Dreams, with an introduction by Danielle Gelehrter. The general rule for this collection is minicomics that were packed in with toys, or were intended to be packed in with toys. Early on, there was no trivia planned. I had touched base with Dark Horse editor Daniel Chabon with some questions about minicomic order and variant differences, and later Val Staples who was coordinating the book contacted me back via Skype on these matters. During a couple of conversations he asked if anything popped into my mind that should be included in the book [comics, booklets, specials], but as they had most things already covered, I mentioned that if the book could include some trivia it would be a cool addition. 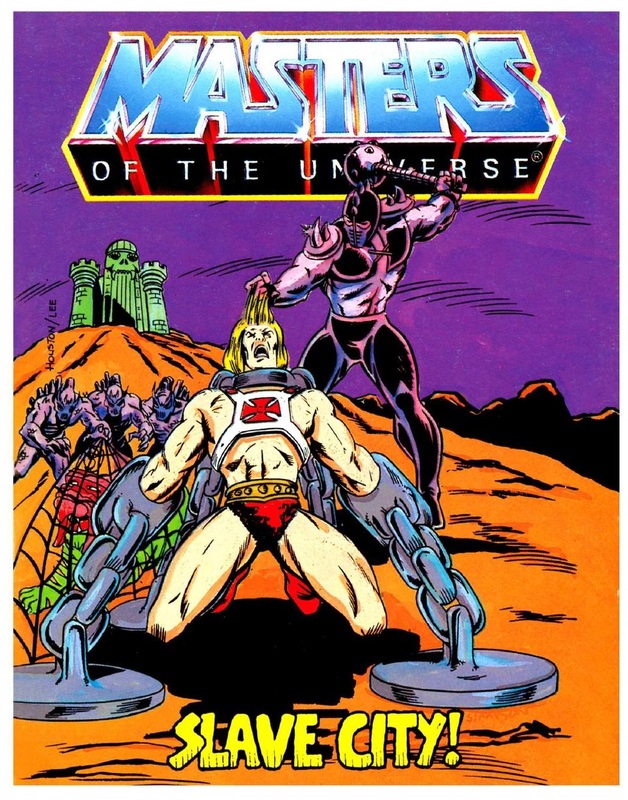 The large bulk of the book is made of up of the original 51 Masters of the Universe minicomics, which were packed in with figures and other toys from 1982 to 1987. Because the comics span six years and were produced by dozens of different artists and writers, there are some quite dramatic tonal shifts throughout the series. 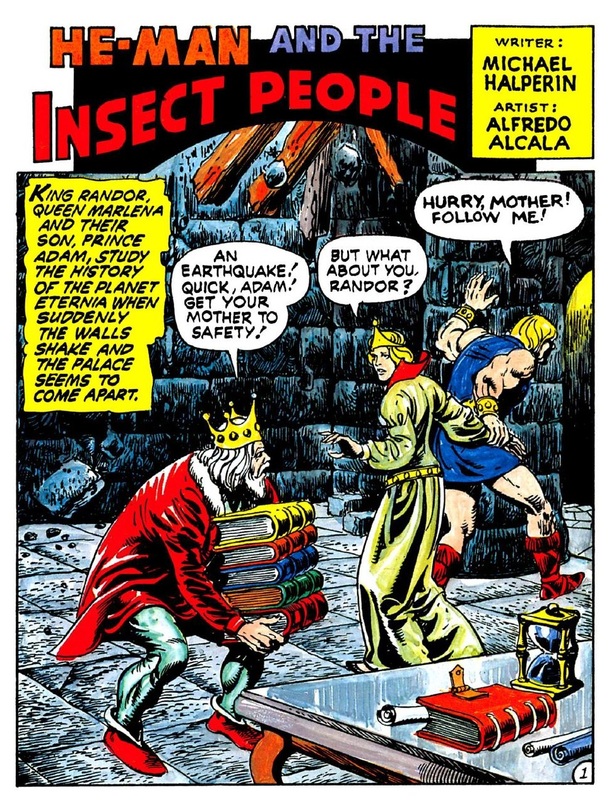 The series begins with the stark jungle-barbarian post-apocalyptic wastelands of the Alfredo Alcala and Don Glut stories, which are the only comics in the series that don’t have speech bubbles. 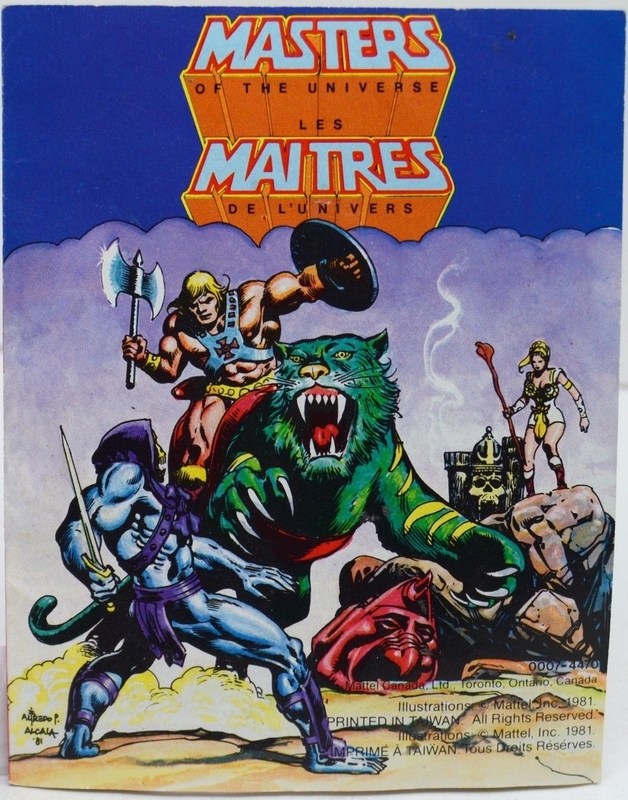 In fact, Mattel called them “adventure books” rather than comics or minicomics. 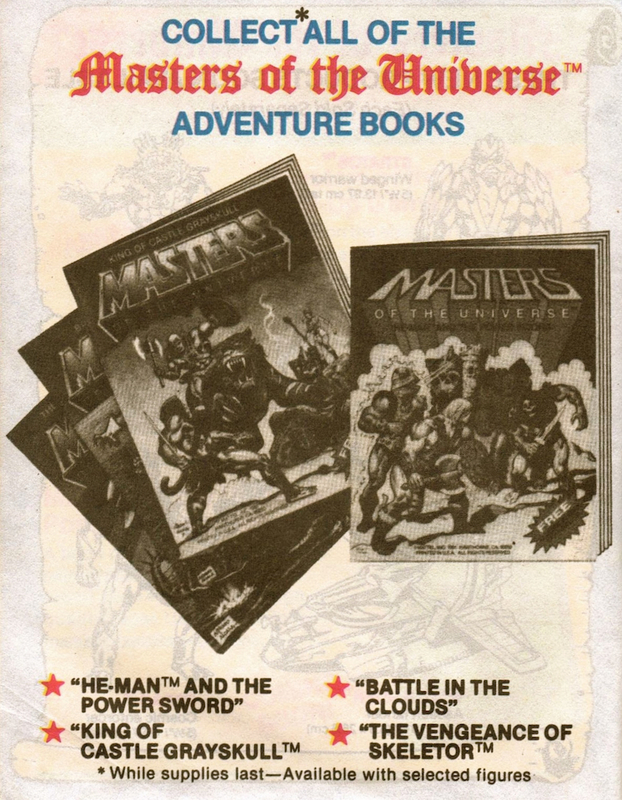 This advertisement appeared in the original He-Man and the Power Sword “adventure book”. However, the Dark Horse collection omits all of the original ads. 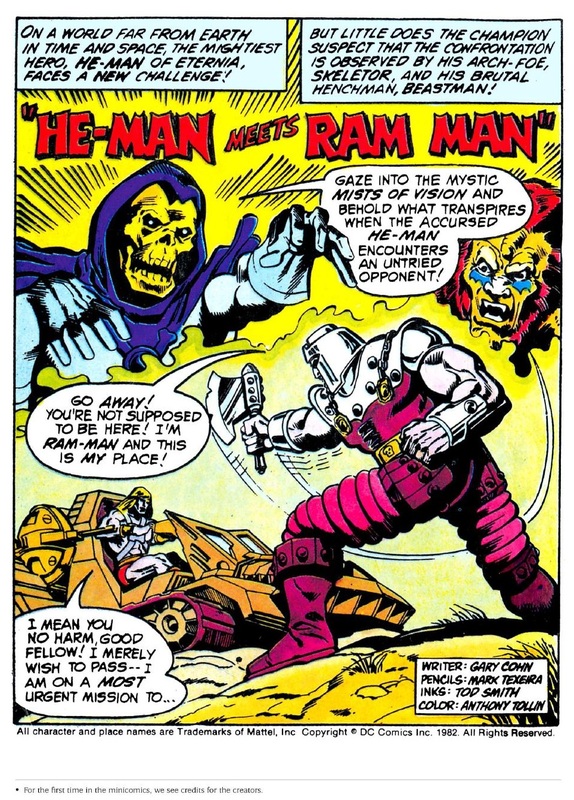 That distinctive style gives way to Mark Texeira and Gary Cohn’s faster-paced bronze age style adventure tales. I’m a big fan of the artwork and storytelling, but I find some of the color choices a bit perplexing sometimes, with emphasis on orangey-browns and vivid magenta throughout. Following the Texeira/Cohn comics, Alfredo Alcala returns to illustrate another series of stories (this time with traditional word bubbles). 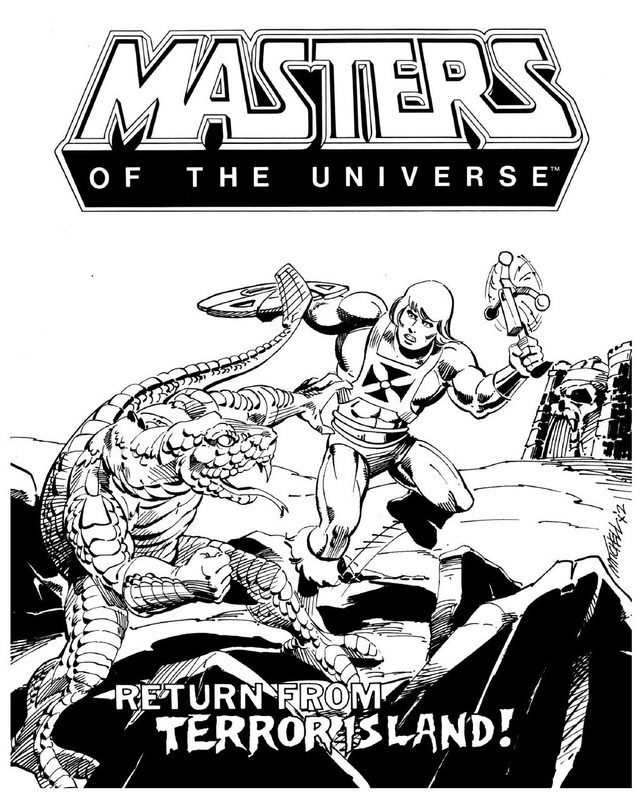 The writer for the next run of Alcala-illustrated comics was most often Michael Halperin, who wrote the original Masters of the Universe Bible. 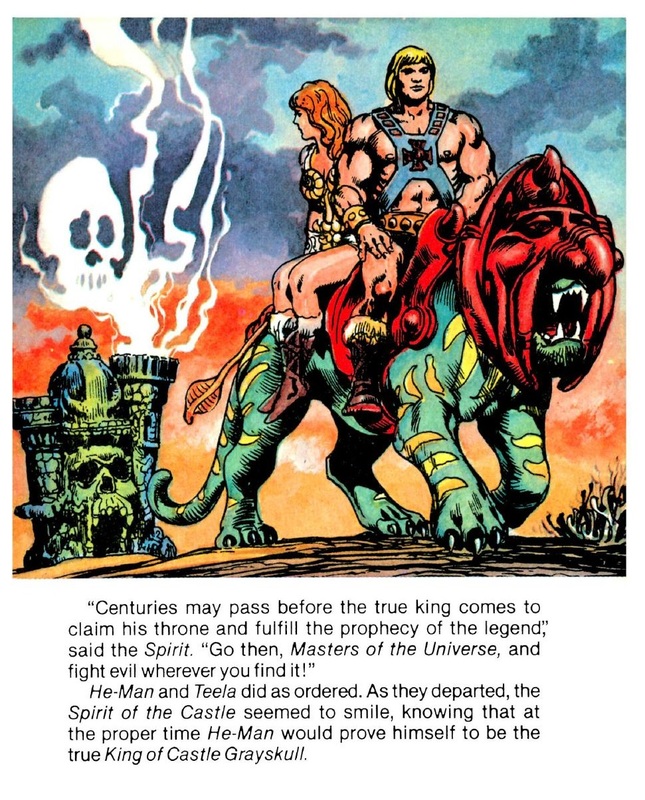 The MOTU Bible contained the “proto-Filmation” canon – that is to say, elements that would influence the development of the Filmation cartoon, but were not identical to the world Filmation created. 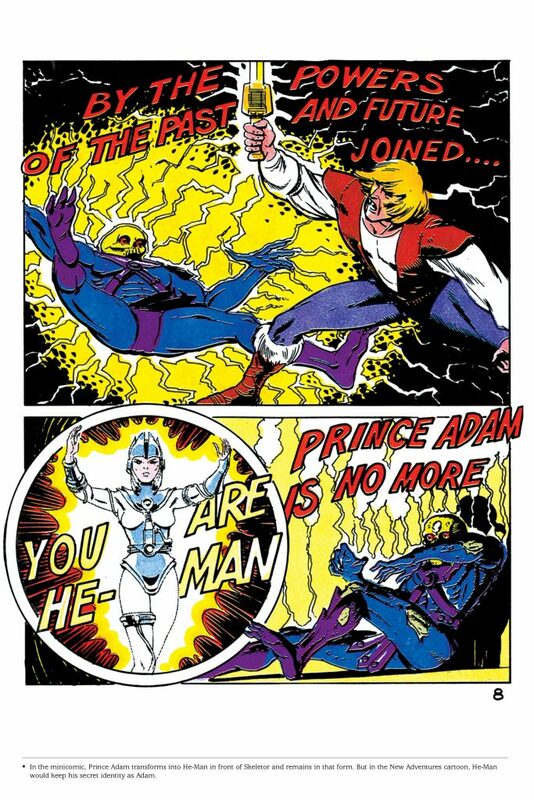 Some examples – Prince Adam exists, but is a more serious character and has a different costume. King Randor is also depicted as a much older man. After a few chaotic and frankly bizarre comics midway through the series (the mini comics for Leech and Mantenna spring to mind), the comics seem to settle into a predictable but solid rhythm and style, particularly when Bruce Timm was at the illustrator desk. 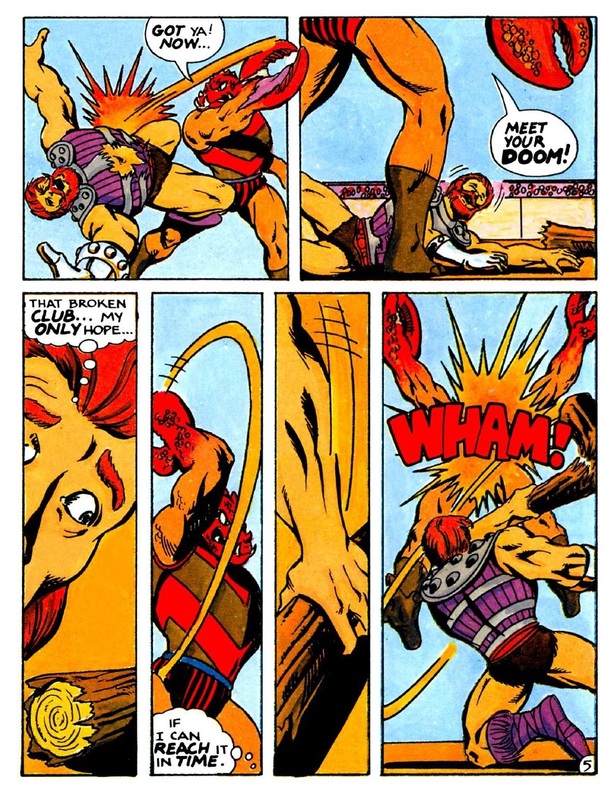 The Filmation influence is present through most of the series, but the mini comics are often just a shade darker, with some actual action and violence (but almost never any real consequences). 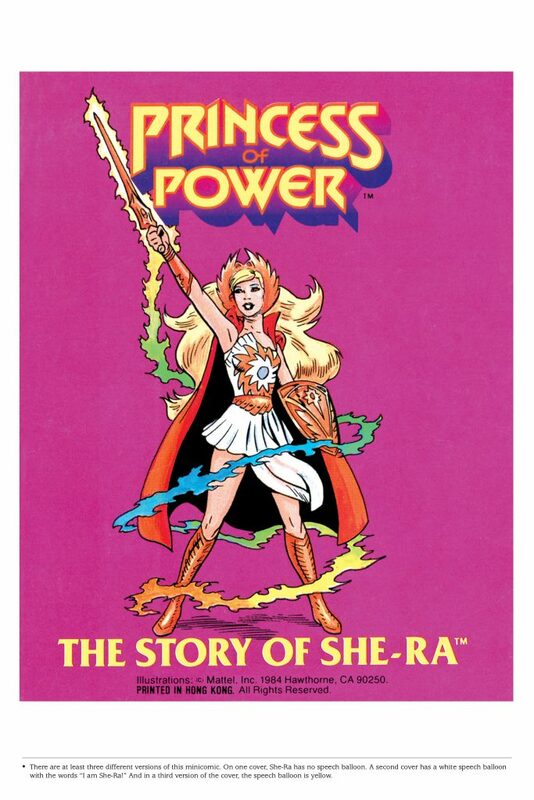 The Dark Horse collection includes all eleven original Princess of Power minicomics, all of which were new to me. 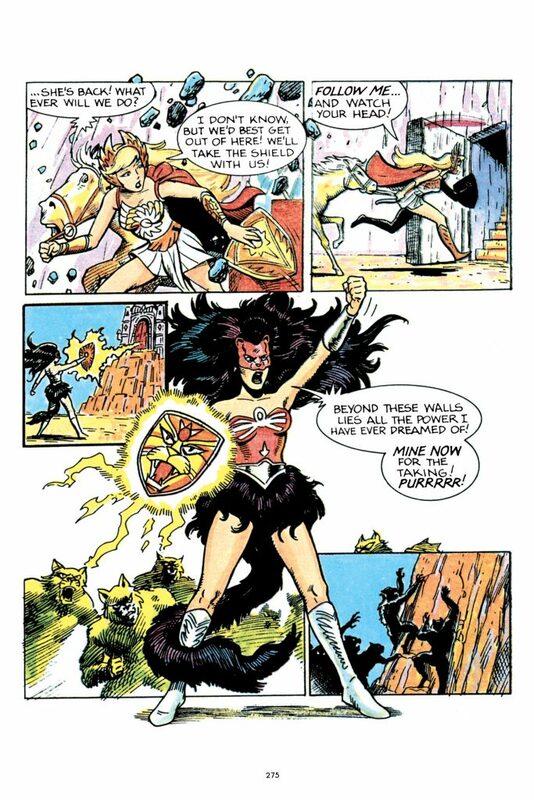 The first of POP comics, The Story of She-Ra, features a brief appearance by Hordak, but otherwise Catra is the main villain, and no other male members of the Evil Horde appear in the series. 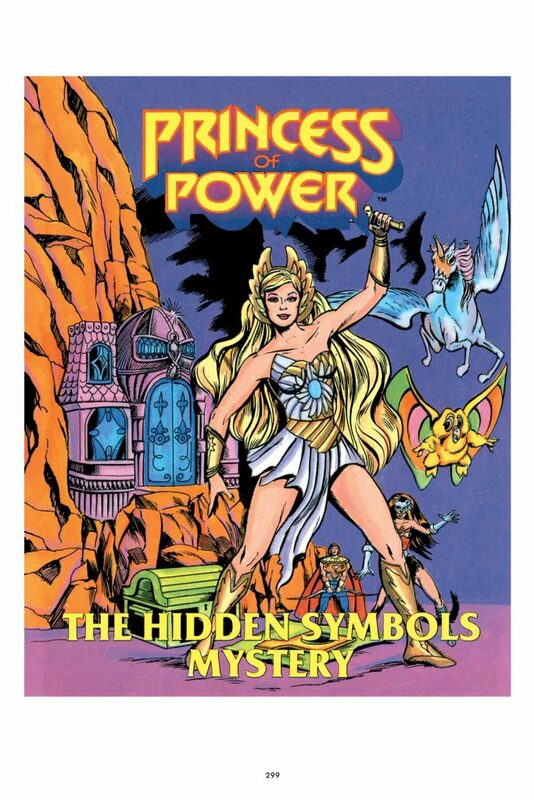 These are tightly contained stories that for the most part focus on Princess of Power-branded characters. 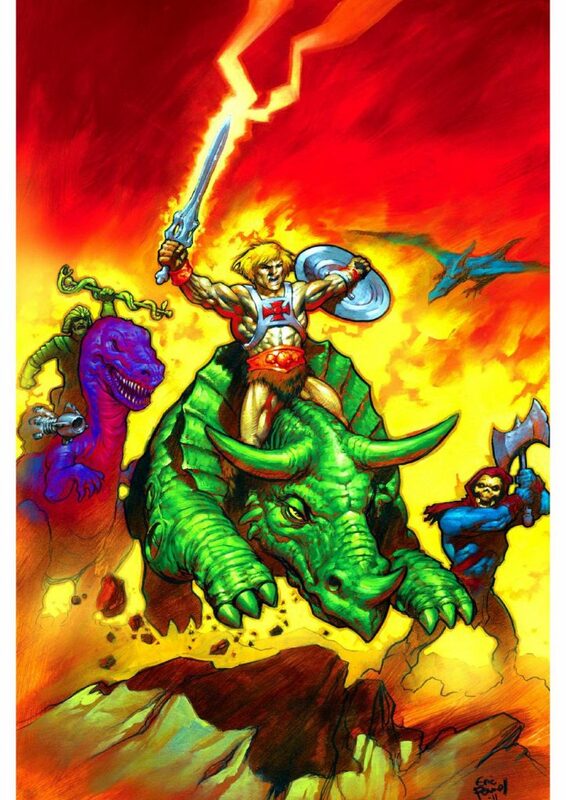 It’s an interesting alternative universe to the Filmation She-Ra series, which not only featured an almost complete line-up of Evil Horde villains, but regularly featured guest characters from He-Man’s world as well. 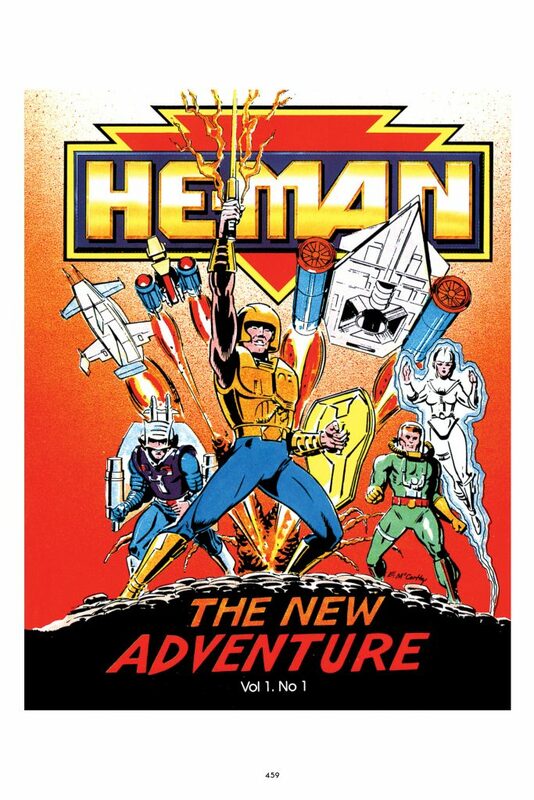 The Dark Horse collection also features all four original New Adventures of He-Man mini-comics (the short-lived sci-fi reboot that immediately followed the original line), a selection of two comics from the 2002 series, and three mini-comics from the modern Masters of the Universe Classics series. 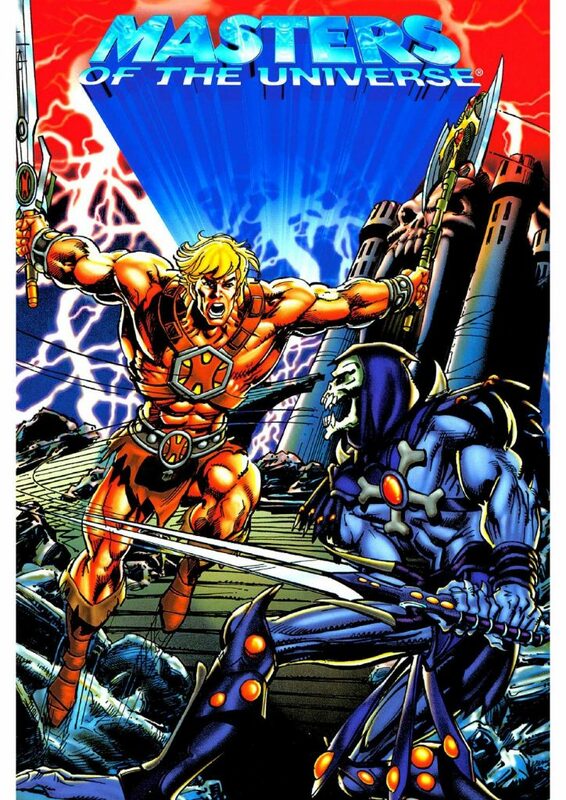 The collection features the one 2002 minicomic that fans were already familiar with, plus another featuring Smash Blade He-Man and Spin Blade Skeletor that was never released. 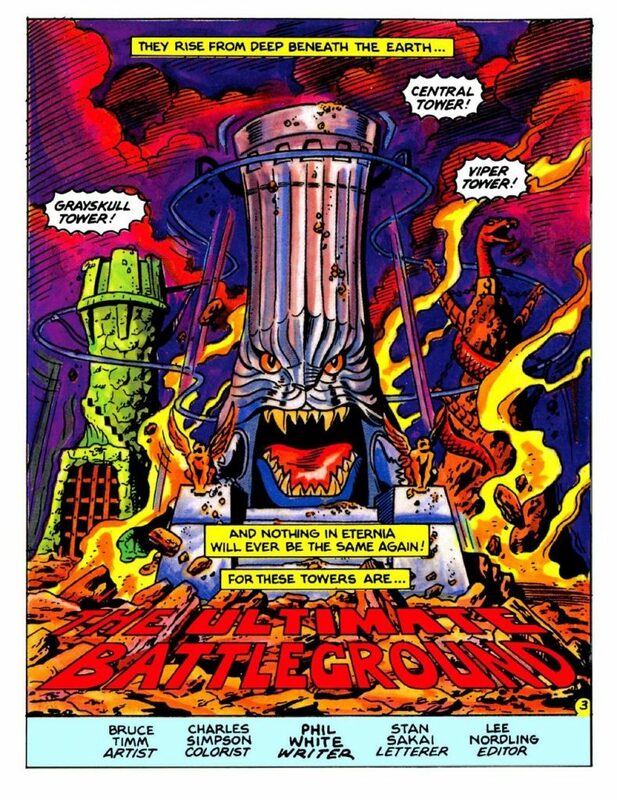 The comics were written by Val Staples and Robert Kirkman, with artwork and colors by Emiliano Santalucia, Enza Fontana, Marko Failla, Neal Adams,Kevin Sharpe, Brian Buccellato, Steve Cobb, and Val Staples. 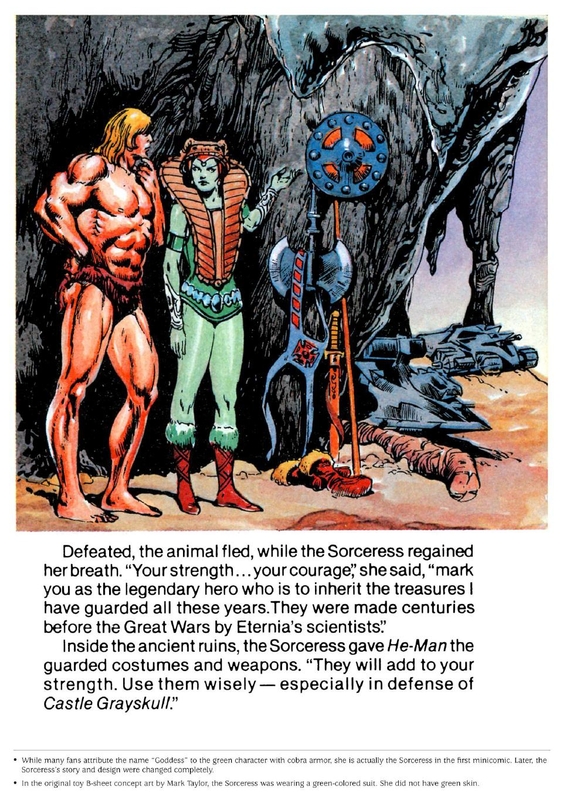 Finally, we get a taste of three minicomics from the 2009 Masters of the Universe Classics series. 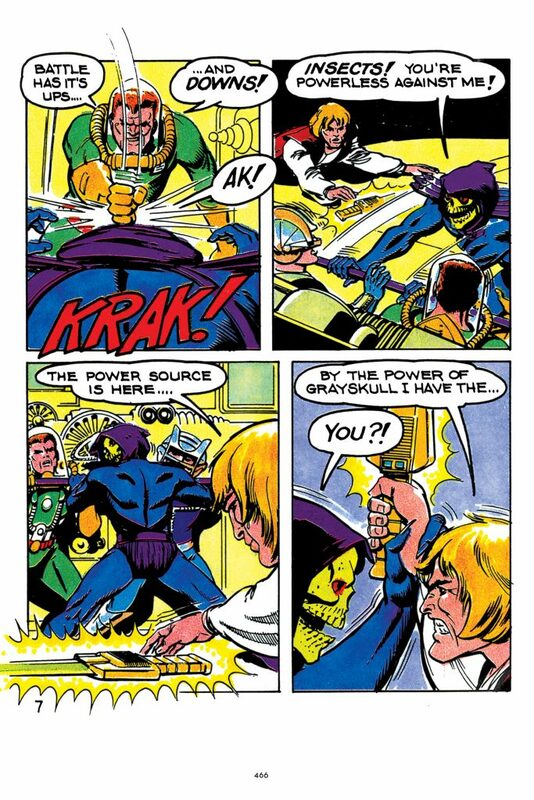 All three were written by Scott Neitlich and Tim Seeley (the first in the series was based on the vintage Powers of Grayskull mini comic written by Phil White and penciled by Larry Houston) and illustrated by Wllinton Alves and Michael Atiyeh. 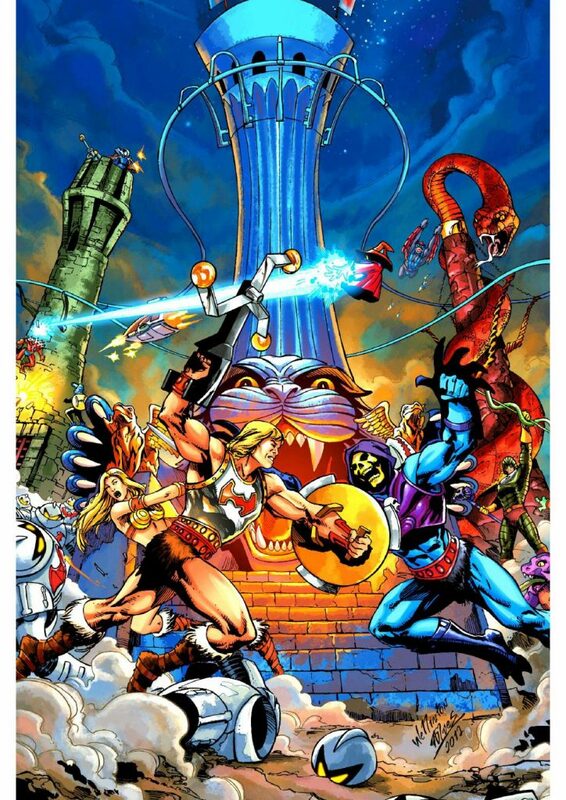 Dark Horse’s Minicomic Collection satisfies a need that had gone unmet for a long time among He-Man and She-Ra fans, but it also whets our appetite for more books along these same lines. 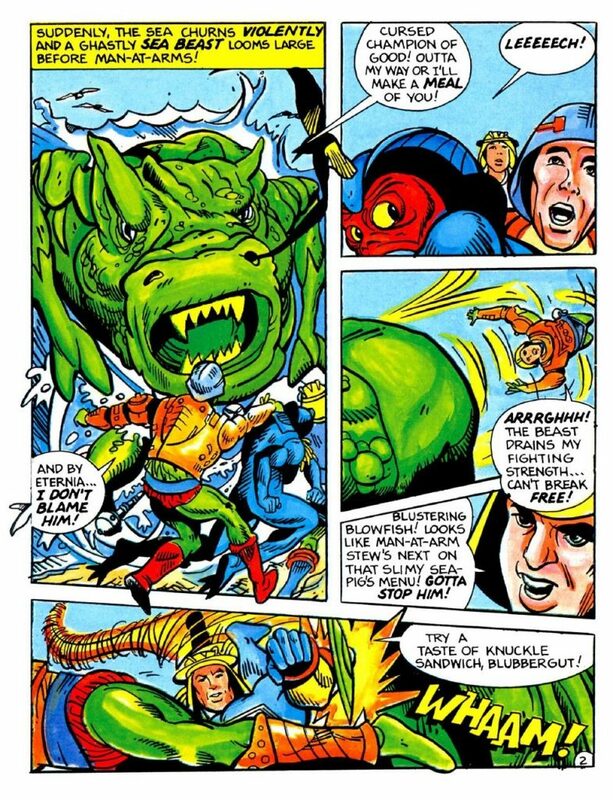 Personally I’d love to see another collection comprised of full-sized MOTU comics and magazines from the 1980s to present day, not to mention a collection of the classic Golden Books adventures. Great compilation book. I’m almost through my second go at it (in between reading other books, too). 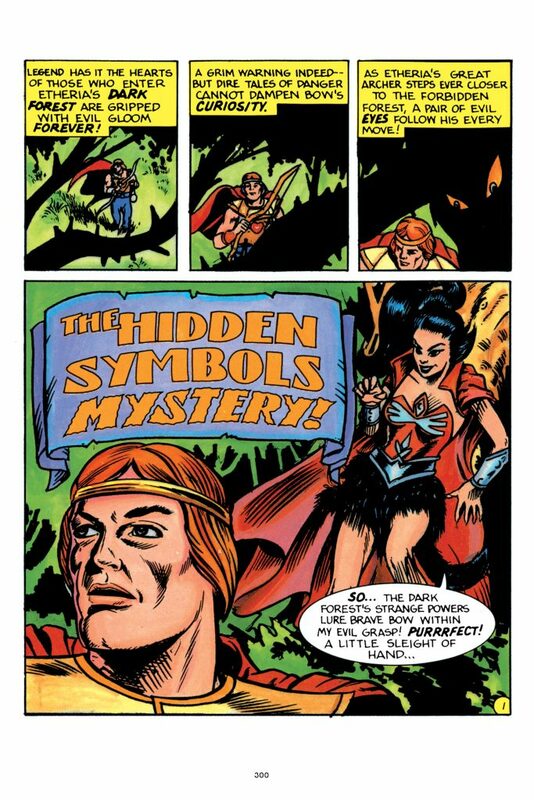 I’ll be getting my MOTU Comic Strip book this Friday from Amazon.ca Great article! 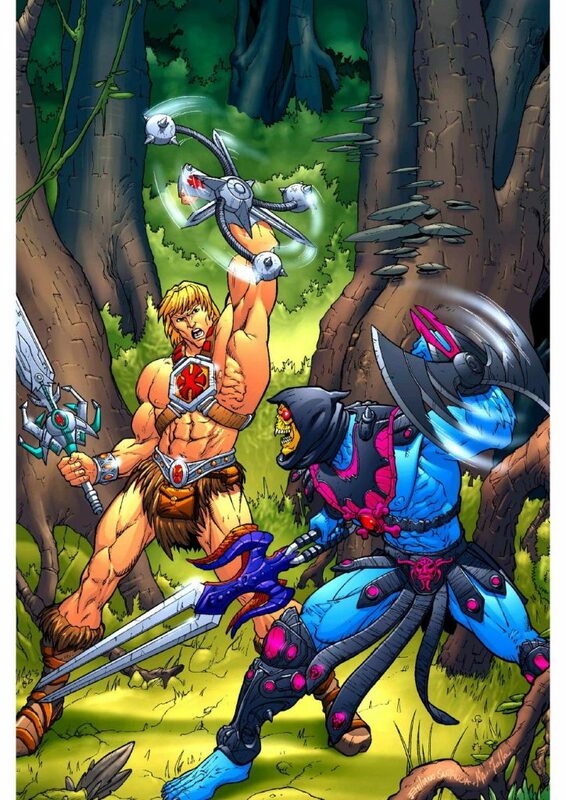 When I was a kid I was born too late to get He-Man toys at the store. So even if I did find something in good condition or complete, I rarely if ever saw a mini-comic. It was a treat getting this collection digitally, I want to get the hardcover book as well but that’s more of a collection thing, I find them much easier to read on my iPad. The Golden Books however were the stories I enjoyed the most repeatedly as a child. I had maybe one or two from my sister and hen when I was a bit older I went to a book store that had a bunch for cheap and got quite the stack. My favourite was the one with Stinkor. 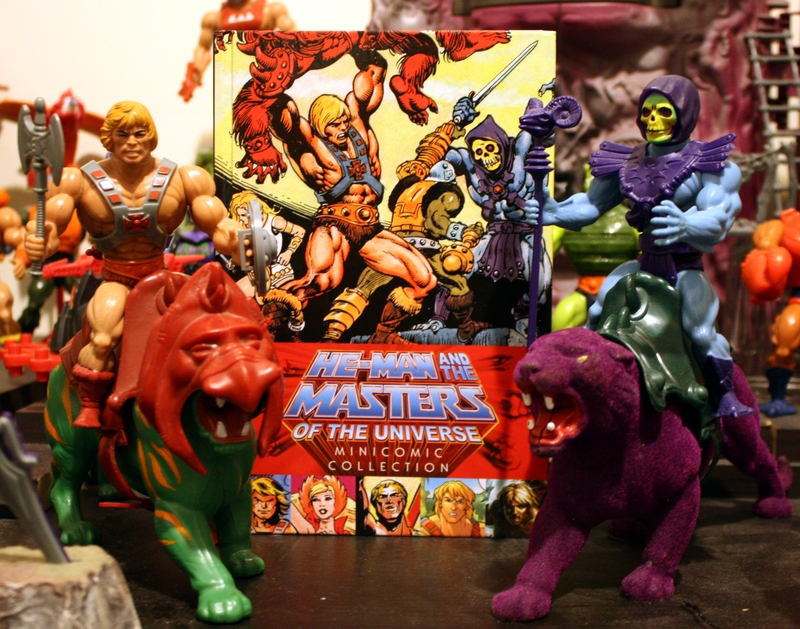 One of my favourite things about He-Man is the toys, the show, any kind of book I got of him, all felt just as enjoyable as the other, and as important a part of the collection unlike other brands. I’m a huge fan of the Golden books as well!